← Top 10 Ways To Go Green – Let’s Make Every Day Earth Day! Check out Swingline’s new Back-to-School sweepstakes where they are giving away a $250 gift card to help you get ready for Back-to-School. They’re also throwing in a backpack filled with all kinds of cool and colorful school supplies including the always popular red stapler from “Office Space” fame. Zuma thought you’d love to see fun ways to save this coming BTS! Hurry — Sweepstakes entry ends August 30, 2103! Click this picture to see all the details and enter the sweepstakes! 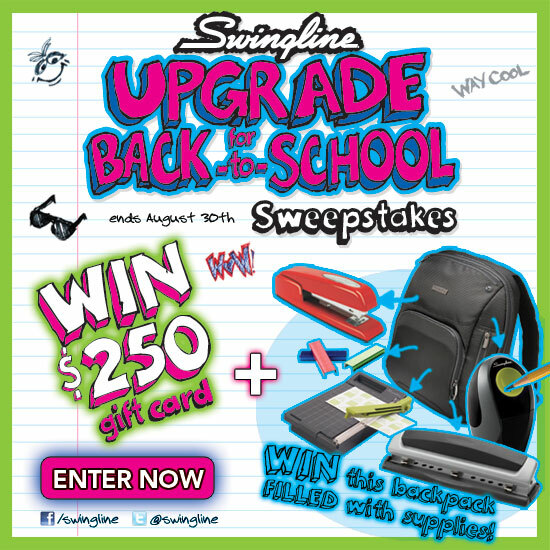 You can also click this link to view all the details – http://www.swinglineblog.com/08/win-250-for-back-to-school-more/. Enter now and good luck! This entry was posted in School Supplies and tagged back-to-school, School supplies, Swingline, Zuma. Bookmark the permalink.